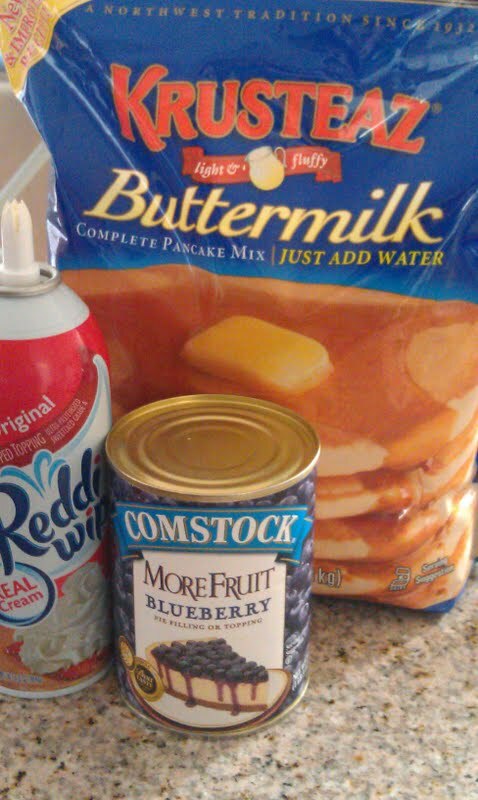 The revolution of the blueberry pancake. 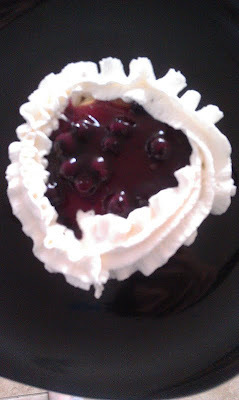 This is my first food blog post, well, ever. I'm pretty excited about it. In fact, this blog was never suppose to be a food blog. It was suppose to be a "our story" blog. And well, as life changes, so does my blog. Ha! I can't promise when the next time I post about food will be, so enjoy it while you can. You should be happy I'm even blogging! You'll be so happy with my choice of food though. Pancakes. Whipping cream. Fruit topping. If, perhaps, you can't eat wheat, you can substitute for a gluten-free pancake mix. Yes, this is all you need to create a little slice of heaven in your mouth. Easy, right? Psst. Don't make fun of my photo skills! 1. Simply make your pancakes. 2. Scoop a few spoonfuls of the fruit topping over pancake. 3. Whip-cream the edges as so. Or, if you're like me, fill in the entire pancake with the whipped cream! 4. Savor every bite. And help yourself to seconds. Or thirds. Like I said, it's very simple, and I promise you, it's delicious. When I made this, (this morning) I ate just this. But, when my mother in-law makes it, she serves it with bacon/sausage/eggs/orange juice. All I wanted today is the pancakes. It's like, a revolution to the "blueberry pancake". Saturday, Christmas Eve was a booked day. We had to be up early to be out of the house by 8:30am. Bright and early at 6:30am, our day started. Thankfully for Oma (Mom), she made a very delicious breakfast. Disneyland breakfast to be exact. Delicious french toast layered with some vanilla sauce and caramel sauce. It's fantastic. YUM. 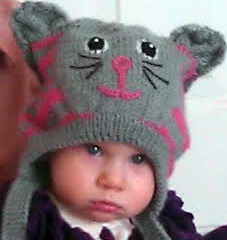 Tylee, T's sister, bought these adorable little beanie's for Emmy and Emmy's younger cousin, Craiger. Aren't they the cutest things ever? She sure has amazing taste! Craiger was happy as can be in his hat. Emmy, on the other hand, was a bit freaked out. She sat on Uncle Trek's lap, scared stiff. Poor little girl ended up tearing up and really freaked out. The hat came off, she was happy. We walked on down to the beach. It was a gorgeous view. Funny thing about those seagulls right there. Auntie Char and I were playing with Emmy on the sand and giving her some Ritz crackers. She had dropped one, and I decided to leave it and said, "Oh, I'm sure the birds will get that later today". Not even 3 seconds after it had fallen, there came a swarm of those birds! It's like they were stalking us or something! Fun fact of the day: Growing up, I always dreamt about marrying someone from California, specifically Southern California, that way we could go back and visit his family often and be in one of my favorite places on earth. T quickly ran over to Emmy, Auntie Char and I and asked if I would take a picture of him with his little girl. How could I not? Then it was my time to stand in front of the camera. Family picture! Some more pictures of the fun time in the sun. More playing, Emmy with Auntie Char (Oma's sister) and Uncle Tuhk (T's brother) playing in the water. It was a happy time. Emery's older cousin Lorian took over the pushing the stroller duties and Emmy loved every min of it. She laughed, smiled, and chatted the whole walk back. Then it was time to head back to Oma and Opa's house to prepare for the Christmas eve traditions. For those who were home, we acted out the nativity scene. It was pretty fun you know. Pretending to be Mary and riding the donkey (Tuhk). haha I had stuffed a blanket under my shirt and little Taya (pictured below) came running up to me and says "Is that baby Craiger under your shirt?! "(She knew her baby brother was going to be Baby Jesus) I smiled and said, "No, it's just a blanket" She replies, "I want to see baby Craiger under your shirt!" As she tries to look up my shirt. Love that little girl! Here is a link to the video of our Nativity play. In the middle of sharing stories, we heard bells jingling up in the master bedroom. Cadence, the eldest niece, jumped up and exclaimed, "Santa! He's here!" We all ran upstairs and followed the sound of the bells and there, by the fireplace in the master bedroom were wrapped presents for all of the children. They all opened them up and found pajamas. Santa made his stop, reminding the children that he would soon be by once again. Wait, can we just look at these little cheeks one last time??? You are welcome! Who says the only way to feel the Christmas spirit is by watching the snow fall outside your window while sipping on some hot cocoa? It wasn't me. In fact, there have been many years in my lifetime where the sun was shining and shorts were acceptable on Christmas day. As I have mentioned in previous posts, I come from a large family. I am number 5 of 7 children. To this date my parents are proud to have 10 grandchildren. T's family, is as well quite large. He is the baby of the 6 total siblings. His parents are proud grandparents to 6 grandchildren. Needless to say, it's important to us to be able to spend time with both sides of the families during the holidays. In order to make things fair, we switch each other year between families and holidays. For example, this year, we went to Texas to see my entire family over Thanksgiving. T's family had Christmas at his parents house and we were able to celebrate the happy weekend with all 17 of us. All the siblings arrived at Mom and Dad's house on different days. Each new day brought more and more joy and someone different showed up. We arrived late Thursday evening. Thankfully, from the nights events, his family had brought us home some Tito's Tacos. I highly recommend this delicious authentic mexican joint (only one ever!). We make sure to eat there at least once every visit. We stayed up late, of course! Chatting and catching each other up on our lives. Friday morning came bright and early. Especially when my mind decided to wake up at 5:45am. WHO DOES THAT?! Especially on vacation?! This girl does apparently. I took advantage of the time (and hot water) to shower, and get myself ready before everyone else woke up. We had a long and exciting day of adventures ahead of us! After breakfast and when everyone was all dressed and ready to go we headed on down to the mall. What's a Christmas weekend without the mall? With all of the hustle and bustle, lights, decorations (and amazing sales!) who could pass it up? We sure didn't want to miss out! After a few hours of walking around, picking up last min items, drinking some delicious vanilla-bean frappuccino with caramel syrup, don't forget the whip(!) , it was time to take the little kiddos on the carousel. Emery wasn't too stoked about riding that ferocious looking lion with Opa, so Daddy took her over to a nice quiet bench on the second tier as they went around, and around, and aroooooooooouuuund. You dizzy yet? Then it was time for Opa, T, Emery and myself to hop in the car for the 2 hour ride to, hold your breath....I mean, where else would we go while in SoCal? 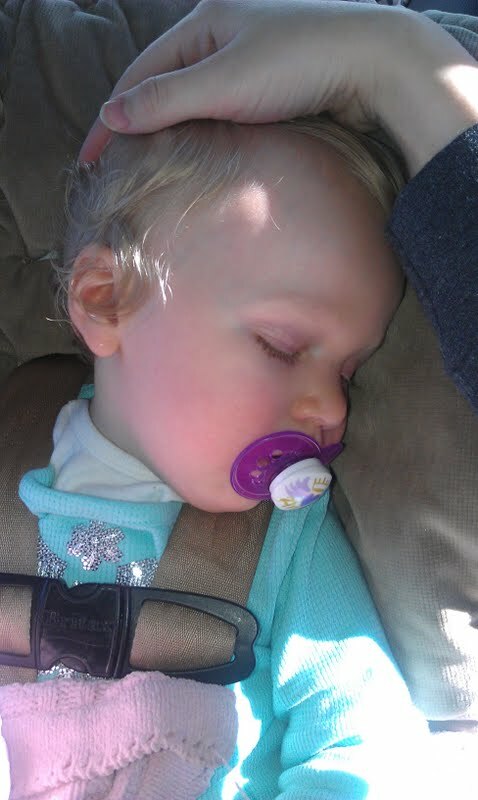 Emmy took advantage of the drive and slept the whole way. Bonus points for those who guessed it! 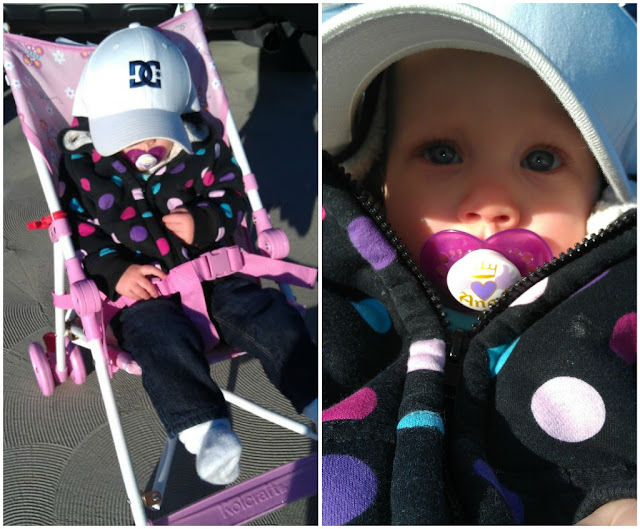 Daddy decided to put his hat on E's head to keep the sun from blinding her. It was the funniest thing, she just sat there. Didn't move. I think she may have even held her breath! haha It was the cutest thing. Do those eyes make your heart jump a little, too? We rode the tram from the parking lot to the entrance and Emmy gazed at all of the scenery. I think she may have remembered her favorite place. We chose to head to California Adventure first. 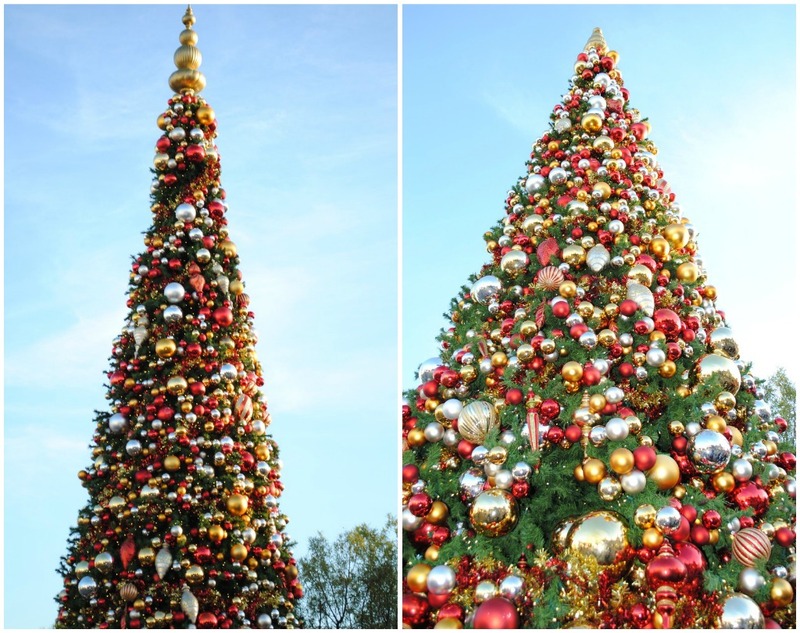 We weren't wanting to spend a lot of time there, just enough to breathe in the happy feelings, see the Christmas decorations, watch the castle get dressed with snowy-like lights and of course, ride the greatest ride out there. None other than Toy Story Mania! The gigantic Christmas tree next to Santa's little cottage. Silly Santa, he was looking at the actual photographer. Emmy was a little scared to say the least. We knew the line would be rather long at Toy Story Mania, so we stopped and picked up some churros to enjoy. Emmy sure loved having some of it, that is for sure! This was her face for the day, her wide-open-mouth-in-amazement face. Trying out the 3D glasses before our turn. Emmy wanted to do it herself. This was T's first time on this ride, mine and Emmy's second time. He had no idea how to play, I had to teach him as we went. He had checked our score board after the first few mins and was astonished at the fact that I was WAY ahead of him in points. Then he caught on and ended up winning in the end. My poor wrist just couldn't keep up with his. Then it was off to Disneyland! We caught the Christmas Parade just in time! It was so fun to see all of the Disney characters come running out with their theme songs. Mickey, Minnie, all of the Princesses with their own handsome prince, Toy Story's famous Buzz and Woody, just to name a few. But of course, it ended with the greatest of them all this time of year. Mr. Santa Claus. He followed behind all of his reindeer. Emmy was especially excited to see him. I think perhaps she warmed up to him. 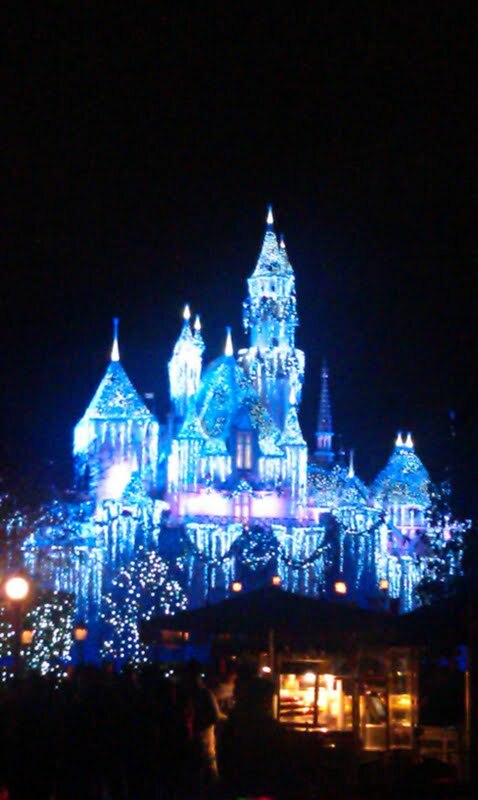 Last, but not least, we finally got to see the castle light up in all of it's glory and spectacularness. I was so happy! There was even fake snow that fell from the streetlights. Unfortunately, the fireworks were cancelled that evening, (I was really looking forward to seeing them!) so we went on to the stores and did a little shopping. Bought a caramel apple, as my tradition goes. The first day of our Christmas break truly was a joy and a dream come true! Stay tuned for the rest of the trip!